My heart is bursting -- with love, with gratitude, with pride. Team Cassie ran the Superhero Half-Marathon and Relay on Sunday and, at 18 runners strong, it was our biggest team to date. This year, Team Cassie raised more than $65,000 (including incoming matching donations), and in six races, we have raised more than $300,000! I don't even know what to make of numbers like that. Luckily, the staff at The Marfan Foundation does. The six half-marathoners and six relay teams included nine returning runners -- Joe Bruns, DanaLynn Colao, Jessica DiPaolo, Jennifer Lynch, Rachna Mathur, Alex Ruttenberg, Sarah Trillin, Ezra, and me -- and nine new runners -- Keri and Ed Arnold, Matt Collins, PJ Flemming, Brian Lynch (Emma's dad -- see below), Nirupama Mallavarupu, Cochil and Jon Sands, and Ben Weisman -- who persevered through the heat and intense humidity wearing their Marfan Foundation running shirts. Their commitment to my family and our favorite cause touches me to the core, and the way our friends, family, and community have rallied around us -- whether in celebratory times like our runs or in tougher times like Cassie's surgeries -- makes me feel so loved and so seen. I thought that both the runners and donors would be tired of us and our race by now, but you all have proven me wrong again and again, and we are so deeply moved by your thoughtfulness, kindness, and generosity. I'd like to highlight that my relay partner was Ben Weisman, with whom I serve on The Marfan Foundation Board of Directors and who has Marfan himself. I was so incredibly inspired by Ben's taking on this challenge [to the extent he was able, considering he has Marfan syndrome] and every time I was ready to quit during my portion of the race (which was way too often), I thought of Ben. His determination is something to be reckoned with. Ben is a great friend and wonderful role model for Cassie and other kids with Marfan syndrome. The Marfan Foundation's annual family conference, held each summer, is the greatest place for support since you meet so many other families affected by Marfan syndrome. Three years ago, we met Jen, Brian, Emma, and Andrew Lynch, who thankfully live only 20 minutes away from us. Becoming friends with the Lynches has proven to me over and over again the value of finding a community. Emma has Marfan. She is an incredibly lovely, kind, warm 12-year-old and both of our girls adore her. Last summer, Cassie was hurt by some kids at camp who were asking her a lot of questions about why her body looks different. ("Why are you so skinny?" "Can you see without your glasses?" "Why are your fingers so long?") These kids were truly curious and not intending to be mean, but Cassie was upset and Penelope suggested that she talk to Emma. I called Jen and explained what was going on. Next thing I knew, Emma was on the line. Cassie took my phone, went in another room, closed the door (teenager at age 7! ), and came out beaming 10 minutes later. Emma was able to cheer Cassie up in a way that only another child with Marfan can. Cassie felt truly understood. I need to feel understood too, and Emma's mom, Jen, and I know all too well what makes the other sad or scared or angry about Marfan. Jen split the Superhero Half relay with me in 2013 and wasn't planning to run the race again. Then her family got the news that Emma will have spinal surgery in December and she decided to revive Team Emma with the two of us running together. I suppose I could have gotten through the race without Jen by my side, but it would have been a lot harder without her encouragement, humor, and empathy -- an easy metaphor for how I feel about her friendship. The whole Marfan community I've met through The Foundation at the conference, and online -- the "Marfia" -- is an incredible place to turn for information, help, and support. I hope it's abundantly clear how very thankful we are to have all of you in our lives and how much your compassion helps us in every way. 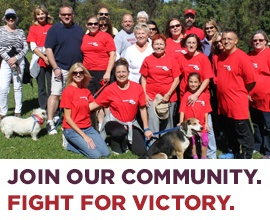 Would you or your family and friends like to walk or run to support The Marfan Foundation? Please contact us at victory@marfan.org. 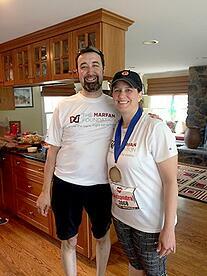 Alix who lives in Madison, NJ, is a member of The Marfan Foundation's Board of Directors. Her daughter, Cassie, was diagnosed with Marfan syndrome in 2007.